Based on the current trajectory, war between the United States and China in the decades ahead is not just possible, but much more likely than recognized at the moment. Indeed, judging by the historical record, war is more likely than not. Moreover, current underestimations and misapprehensions of the hazards inherent in the U.S.-China relationship contribute greatly to those hazards. A risk associated with Thucydides’s Trap is that business as usual—not just an unexpected, extraordinary event—can trigger large-scale conflict. When a rising power is threatening to displace a ruling power, standard crises that would otherwise be contained, like the assassination of an archduke in 1914, can initiate a cascade of reactions that, in turn, produce outcomes none of the parties would otherwise have chosen. War between the U.S. and China is more likely than recognized at the moment. Indeed, judging by the historical record, war is more likely than not. Eight years before the outbreak of world war in Europe, Britain’s King Edward VII asked his prime minister why the British government was becoming so unfriendly to his nephew Kaiser Wilhelm II’s Germany, rather than keeping its eye on America, which he saw as the greater challenge. The prime minister instructed the Foreign Office’s chief Germany watcher, Eyre Crowe, to write a memo answering the king’s question. Crowe delivered his memorandum on New Year’s Day, 1907. The document is a gem in the annals of diplomacy. However unimaginable conflict seems, however catastrophic the potential consequences for all actors, however deep the cultural empathy among leaders, even blood relatives, and however economically interdependent states may be—none of these factors is sufficient to prevent war, in 1914 or today. When a rising, revolutionary France challenged Britain’s dominance of the oceans and the balance of power on the European continent, Britain destroyed Napoleon Bonaparte’s fleet in 1805 and later sent troops to the continent to defeat his armies in Spain and at Waterloo. As Otto von Bismarck sought to unify a quarrelsome assortment of rising German states, war with their common adversary, France, proved an effective instrument to mobilize popular support for his mission. 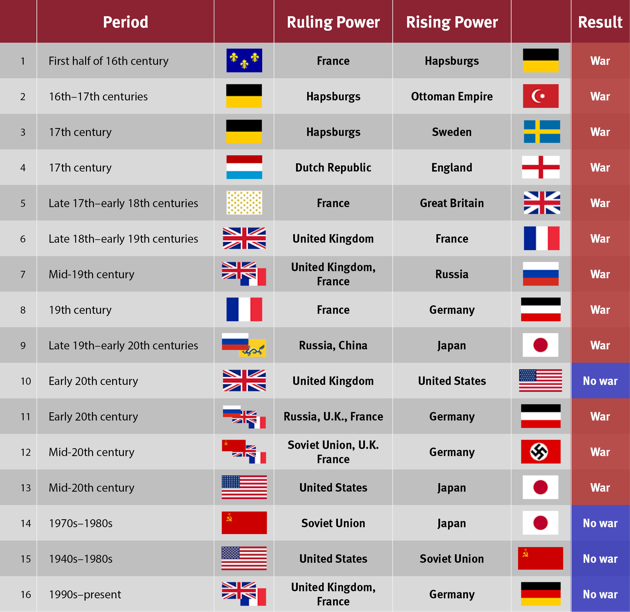 After the Meiji Restoration in 1868, a rapidly modernizing Japanese economy and military establishment challenged Chinese and Russian dominance of East Asia, resulting in wars with both from which Japan emerged as the leading power in the region. The preeminent geostrategic challenge of this era is not violent Islamic extremists or a resurgent Russia. It is the impact of China’s ascendance. Each case is, of course, unique. Ongoing debate about the causes of the First World War reminds us that each is subject to competing interpretations. The great international historian, Harvard’s Ernest May, taught that when attempting to reason from history, we should be as sensitive to the differences as to the similarities among cases we compare. (Indeed, in his Historical Reasoning 101 class, May would take a sheet of paper, draw a line down the middle of the page, label one column “Similar” and the other “Different,” and fill in the sheet with at least a half dozen of each.) Nonetheless, acknowledging many differences, Thucydides directs us to a powerful commonality. The preeminent geostrategic challenge of this era is not violent Islamic extremists or a resurgent Russia. It is the impact that China’s ascendance will have on the U.S.-led international order, which has provided unprecedented great-power peace and prosperity for the past 70 years. As Singapore’s late leader, Lee Kuan Yew, observed, “the size of China’s displacement of the world balance is such that the world must find a new balance. It is not possible to pretend that this is just another big player. This is the biggest player in the history of the world.” Everyone knows about the rise of China. Few of us realize its magnitude. Never before in history has a nation risen so far, so fast, on so many dimensions of power. To paraphrase former Czech President Vaclav Havel, all this has happened so rapidly that we have not yet had time to be astonished. My lecture on this topic at Harvard begins with a quiz that asks students to compare China and the United States in 1980 with their rankings today. The reader is invited to fill in the blanks. 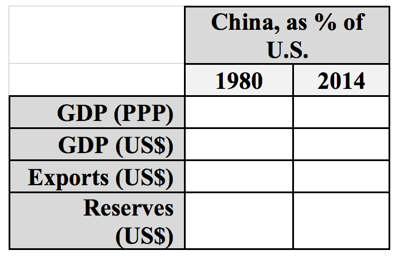 The answers for the first column: In 1980, China had 10 percent of America’s GDP as measured by purchasing power parity; 7 percent of its GDP at current U.S.-dollar exchange rates; and 6 percent of its exports. The foreign currency held by China, meanwhile, was just one-sixth the size of America’s reserves. The answers for the second column: By 2014, those figures were 101 percent of GDP; 60 percent at U.S.-dollar exchange rates; and 106 percent of exports. China’s reserves today are 28 times larger than America’s. In a single generation, a nation that did not appear on any of the international league tables has vaulted into the top ranks. In 1980, China’s economy was smaller than that of the Netherlands. Last year, the increment of growth in China’s GDP was roughly equal to the entire Dutch economy. The second question in my quiz asks students: Could China become #1? In what year could China overtake the United States to become, say, the largest economy in the world, or primary engine of global growth, or biggest market for luxury goods? Most are stunned to learn that on each of these 20 indicators, China has already surpassed the U.S.
Will China be able to sustain economic-growth rates several times those of the United States for another decade and beyond? If and as it does, are its current leaders serious about displacing the U.S. as the predominant power in Asia? Will China follow the path of Japan and Germany, and take its place as a responsible stakeholder in the international order that America has built over the past seven decades? The answer to these questions is obviously that no one knows. As the United States emerged as the dominant power in the Western hemisphere in the 1890s, how did it behave? Future President Theodore Roosevelt personified a nation supremely confident that the 100 years ahead would be an American century. Over a decade that began in 1895 with the U.S. secretary of state declaring the United States “sovereign on this continent,” America liberated Cuba; threatened Britain and Germany with war to force them to accept American positions on disputes in Venezuela and Canada; backed an insurrection that split Colombia to create a new state of Panama (which immediately gave the U.S. concessions to build the Panama Canal); and attempted to overthrow the government of Mexico, which was supported by the United Kingdom and financed by London bankers. In the half century that followed, U.S. military forces intervened in “our hemisphere” on more than 30 separate occasions to settle economic or territorial disputes in terms favorable to Americans, or oust leaders they judged unacceptable. When Deng Xiaoping initiated China’s fast march to the market in 1978, he announced a policy known as “hide and bide.” What China needed most abroad was stability and access to markets. The Chinese would thus “bide our time and hide our capabilities,” which Chinese military officers sometimes paraphrased as getting strong before getting even. With the arrival of China’s new paramount leader, Xi Jinping, the era of “hide and bide” is over. Nearly three years into his 10-year term, Xi has stunned colleagues at home and China watchers abroad with the speed at which he has moved and the audacity of his ambitions. Domestically, he has bypassed rule by a seven-man standing committee and instead consolidated power in his own hands; ended flirtations with democratization by reasserting the Communist Party’s monopoly on political power; and attempted to transform China’s engine of growth from an export-focused economy to one driven by domestic consumption. Overseas, he has pursued a more active Chinese foreign policy that is increasingly assertive in advancing the country’s interests. Never before in history has a nation risen so far, so fast. In 1980, China’s economy was smaller than the Netherlands’. Last year, the increment of growth in China’s GDP was equal to the Dutch economy. While the Western press is seized by the storyline of “China’s economic slowdown,” few pause to note that China’s lower growth rate remains more than three times that of the United States. Many observers outside China have missed the great divergence between China’s economic performance and that of its competitors over the seven years since the financial crisis of 2008 and Great Recession. That shock caused virtually all other major economies to falter and decline. China never missed a year of growth, sustaining an average growth rate exceeding 8 percent. Indeed, since the financial crisis, nearly 40 percent of all growth in the global economy has occurred in just one country: China. 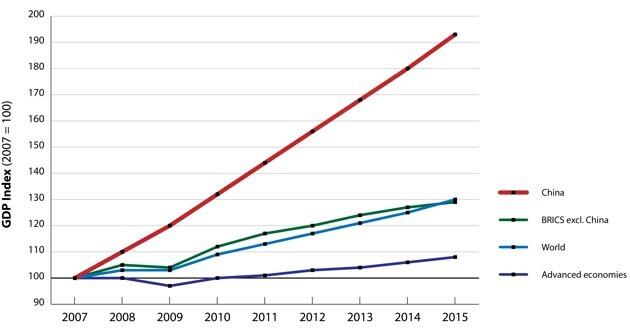 The chart below illustrates China’s growth compared to growth among its peers in the BRICS group of emerging economies, advanced economies, and the world. From a common index of 100 in 2007, the divergence is dramatic. Today, China has displaced the United States as the world’s largest economy measured in terms of the amount of goods and services a citizen can buy in his own country (purchasing power parity). Given objective trends, realists see an irresistible force approaching an immovable object. They ask which is less likely: China demanding a lesser role in the East and South China Seas than the United States did in the Caribbean or Atlantic in the early 20th century, or the U.S. sharing with China the predominance in the Western Pacific that America has enjoyed since World War II? And yet in four of the 16 cases that the Belfer Center team analyzed, similar rivalries did not end in war. If leaders in the United States and China let structural factors drive these two great nations to war, they will not be able to hide behind a cloak of inevitability. Those who don’t learn from past successes and failures to find a better way forward will have no one to blame but themselves. At this point, the established script for discussion of policy challenges calls for a pivot to a new strategy (or at least slogan), with a short to-do list that promises peaceful and prosperous relations with China. Shoehorning this challenge into that template would demonstrate only one thing: a failure to understand the central point I’m trying to make. What strategists need most at the moment is not a new strategy, but a long pause for reflection. If the tectonic shift caused by China’s rise poses a challenge of genuinely Thucydidean proportions, declarations about “rebalancing,” or revitalizing “engage and hedge,” or presidential hopefuls’ calls for more “muscular” or “robust” variants of the same, amount to little more than aspirin treating cancer. Future historians will compare such assertions to the reveries of British, German, and Russian leaders as they sleepwalked into 1914. The rise of a 5,000-year-old civilization with 1.3 billion people is not a problem to be fixed. It is a condition—a chronic condition that will have to be managed over a generation. Success will require not just a new slogan, more frequent summits of presidents, and additional meetings of departmental working groups. Managing this relationship without war will demand sustained attention, week by week, at the highest level in both countries. It will entail a depth of mutual understanding not seen since the Henry Kissinger-Zhou Enlai conversations in the 1970s. Most significantly, it will mean more radical changes in attitudes and actions, by leaders and publics alike, than anyone has yet imagined. For Academic Citation: Allison, Graham. “The Thucydides Trap: Are the U.S. and China Headed for War?.” The Atlantic, September 24, 2015.